Additionally, Jaguar TPD offers the unique capabilities of real-time processing and display features that allow you to fully document the test event as the data is being stored to the TPD hard drives. Depending on the application, you may store raw time history files or processed data to the TPD. The TPD feature are also supported for large channel count applications (greater that 500 channels) where a Jaguar system may be configured with multiple Acquistion & Control Peripherals (ACP). Each ACP supports independent TPD contrllers and drives for no reduction in test bandwidth or storage bandwidth. 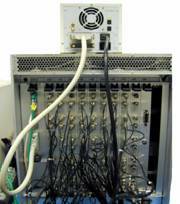 The multiple ACP's support simultaneous synchronixed sampling and storage for the full channel count. Implementation: With the addition of a proprietary Fast SCSI port added to the MDSP3 middle processor in the ACP, the disk drives, up to six, 18 Gbytes ea. store up to 98 channels of data sampled up to 25,600 times /sec each. Other combinations to 51.2k are furnished. The data format is extremely dense for optimum efficiency. 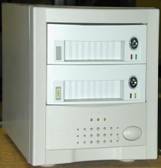 The Drives: The large ACP shown at left may house 1 or 2 drive(s) internally and up to 4 additional drives in the caddy shown on top of the ACP. The external drives may be swapped, allowing rapid expansion for sequential tests, without waiting to download the disks to the host. om Analysis feature. Signal and Transient Capture support time history storage and play back. In addition both may playback files from MISO and MIMO Random, with analysis. Sine Analysis will play back Signal data from TPD, allowing Tracking Filtered analysis of raw time histories while preserving the original time history. MISO Sine Control will store and analyze complex data rather than time histories. This permits H(f) pairings to be re-established for additional analysis of original data. Long Term Storage: TPD files are very dense and must be converted to an open architecture for post-test use. JAGUAR permits the storage of the dense file to the host as intermediate storage. 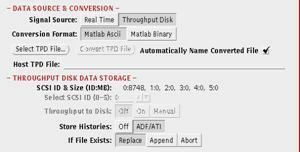 The user may also choose to translate and store, at the push of a button, in I-deas™ATI format, MatLab ASCI or MatLab Binary formats to the host disk or to optional fast SCSI drives that can be removable. Benefits: JAGUAR represents extraordinary quality and accuracy of measurement with near perfect phase matching, 96dB of dynamic range and absolutely alias free data. No tape deck matches it. No tape deck is as inexpensive.File based operation means never waiting for data searches. No external signal conditioning beyond what you use for your original acquisition. Instrument Like Operation: Simple push button operation in each application. With simple button operation the TPD storage may be started and stopped during acquisition without disrupting the application. Not all applications support this feature.